“I’ve never even kissed a man! Can you imagine, after all these years and I’ve never had the secret pleasure, I presume, of pressing my lips against a bristled face?” Thomas said as he rested an elbow on the back of his chair, looking forward as he addressed the man seated behind him. He took off his hat again and fidgeted with it a moment before placing it back on his head and glancing back again. The old man looked at Thomas briefly, tilted his head like a mildly intrigued dog, then turned back to the window. Thomas hugged himself, swaying slightly and nodding with wide eyes at the old man. The aged gentleman furrowed his robust eyebrows, his big round eyes quite open. He scooted back slightly in his chair, crossed one leg, and bent over to re-roll his trousers, which appeared to be several inches too long. He smiled slightly at Thomas and looked back out the window, taking in a deep breath of mountain air. Thomas turned back around and looked out the window of the tiny funicular, to the snow-glazed mountains that surrounded them. The tottering little train had been stuck on the track for almost an hour, forcing an absurdly majestic view on the two strangers, who for whatever reason had decided to make the trek up the mountains that day. On the second day of his stay in Berne, Thomas asked the concierge to recommend a nice place to visit while he was in town. The well-trimmed young man didn’t even think before he said the Gelmer funicular. “Oh yes, Funicular is a lovely place, I’ve heard.” Thomas nodded as he signed the bill for his laundry service and returned the money clip to his pocket. He glanced to his watch, then up to the clock on the wall to see if they were matched. So the next day Thomas decided that yes, he should go see this cable train the young man had mentioned. He donned his wool scarf and cap, and decided to go ride the thing after his early morning meeting. 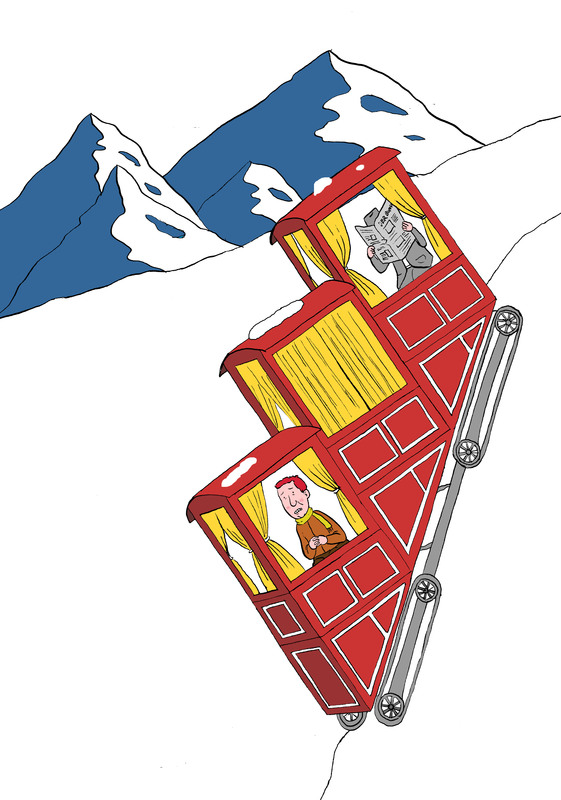 The young man had neglected to inform Thomas that the ride to Zermatt from the hotel was nearly three hours, and a lengthy on-foot voyage to the funicular from the station once he arrived. So almost four hours later there he was with some old mountain man sitting behind him, on a cable car so steep it had steps on the inside. Thomas thought of the train conductor who had saluted the two travelers as they rode off together, alone on the vertiginous machine. He longed for that man, and wished he would appear to tell them there was no problem, just a goat on the tracks, moving along soon. But no, that man was many moons away, at the peak of some absurd mountain. Maybe he’d forgotten about them and had gone home for the day, and Thomas and this man would be forced into a manly cuddle to stay warm through the night. He looked over to the man, who was at that point enjoying the day’s newspaper, crinkling it loudly here and there as he turned a page. The man briefly tilted his head back and peered at Thomas over his paper, exposing a bristly fluff of nose hairs before slowly shifting back to reading position. The funicular took a sudden jolt forward several inches, stopped, then crept backwards a few paces. The halting wheels sounded like buildings collapsing in slow motion, and Thomas closed his eyes, trying to think of his wife’s arms in a warm bed, but all he saw were people falling through fog. He opened them again and turned to look back at the gentleman behind him, just as the funicular took another jolt. The old man coughed loudly and gripped Thomas’ chair, dropping his periodical. He mumbled something in a surprisingly light-hearted tone as he bent down to gather his papers, but banged his head on Thomas’ chair when the train took yet another lurch forward. Merde, Thomas heard, as the man sat up with his newspaper, rubbing the crown of his head. Thomas tried to think of anything other than death. He thought about his wife, and the way she applied lipstick. She would spread her mouth into a big, flat smile, and slowly smooth the pigments across the plush surfaces. If platypuses had lips, they would look exactly like Marissa’s during her routine. He recalled a few nights before he’d left, they had gone to the symphony. Marissa’s lips were enhanced by a deep red, which rather finely complimented her green velour dress. One would imagine such a garment would be terribly out of fashion but she pulled it off like Scarlet O’Hara, her lovely neck held high, her deep brown hair following behind her as she walked. When the orchestra started to play a piece by Ponchielli, Thomas recalled an animated movie where ballerina hippos and giraffes danced across a stage, their massive bodies teetering over pointed shoes. He smiled and wondered if Ponchielli would have approved. Thomas leaned his face close to his wife’s, to share with her this humorous connection, but as his mouth reached her ears, he realized that silent tears streamed down her cheeks. When he paused and started to lean back, Marissa pressed her red lips into his with a great force, mistaking his lean as a gesture of intimacy. Thomas looked out the window again, seeing that even the birds were far below them. The only other creature besides him and the bearded mountain man was a lone goat in the distance, tiptoeing along the rocks. Thomas closed his eyes and imagined the sound of hooves moving along earth. The old man sighed loudly and broke Thomas’ brief moment of serenity. “S’il vous plaît,” the man said suddenly, looking at Thomas with his eyebrows brought to a point. He sat suddenly erect and placed both hands on his knees and took a sharp breath. This change in posture alarmed Thomas. Even the old man was aware that they were potentially quite doomed. Thomas turned back around and stared at the floor in front of him. The old gentleman exhaled loudly and groaned. “Are you okay?” Thomas turned back around, his hands on the back of his chair like the kid at a diner who keeps looking at the table behind him. The old man peered at him through half-closed eyes and winced again in reply. He inhaled deeply, his thick chest expanding, curly patches of grayish brown hair suddenly more visible through the top of his shirt. He exhaled slowly, as if he were blowing out a long plume of cigarette smoke. Thomas closed his eyes, afraid to look at the potentially dying man, and turned around very slowly, as if moving too quickly might knock the old man out of his seat. He kept his eyes closed and thought about Marissa. She was probably at home, her pants soiled from kneeling in the yard, carefully tending to whatever plants it was she kept in the back. What a miserable man, to not even pretend to listen to his wife’s plans for their little autumnal garden. “You know, she could have come with me on this trip,” Thomas said. He shrugged, his eyes still closed. “I said I’d be too busy researching.” He scoffed and shook his head. There was a slight shift in the funicular, and Thomas gripped the bench and opened his eyes. He turned back around to see the old man slowly easing himself up. “Oh sir, please don’t stand!” Thomas begged, anchoring to his bench again. He could almost hear the sound of breaking metal as he pictured the top two wheels unhinging from the track and the cables snapping. The funicular would roll like a loose pinball down the mountain, repeatedly jolting the two men inside as it ricocheted against rocks and trees. The old man stood and looked out the window on the north side, facing what looked like a thimble-sized lake below. He grunted and heaved himself into a standing position, his scuffed loafers balancing carefully on the bench. “Sir please don’t!” Thomas extended his hands to the man, like reaching for a toddler who wasn’t ready to jump into his arms. Thomas took off his hat and rubbed his head with his palms. This could be it. The old man decided the whole ordeal was too much for him, and he was going to fly into the crisp air, leaving Thomas to die frigid and alone. “Please sit down,” Thomas’ voice echoed back only the word down. The old man expertly ignored Thomas’ pleas and leaned one hand on the open window. He took several deep breaths and looked solemnly out to the precipitous terrain that awaited him. The man slowly moved his free hand down, his other hand gripping tight, and unzipped his trousers. And with one final, glorious exhalation, the old man relieved himself out the side of the funicular, aiming in a rather pleasing arch that flowed onto the mountains below them. Thomas sighed with a similar rush of relief, and watched the man for a moment too long before looking back to the mountains in front of him. In the distance he could make out the tip of the Matterhorn. It looked just like the folks at Disney had portrayed it, and almost did not seem real. He took a strange comfort in the man’s relief, letting the sound of blowing wind and trickling liquid combine into one noise, like a magnificent waterfall blasting down onto mossy rocks and shrubbery. After quite the lengthy release, the mountaineer zipped up his oversized trousers, clapped his hands once, then rubbed them in a congratulatory job-well-done. He took his seat once again and sighed happily. “Better?” Thomas asked as he turned around again. The old man dug into his jacket pocket and pulled out a sandwich wrapped neatly in wax paper. He smiled as he set it on his knees and gingerly unfolded the little envelope. The paper made a pleasing crinkle as it unveiled the sandwich. Thomas’ stomach growled with desire, and he had to look away as the seedy bread made its debut. A thick finger tapped Thomas’ shoulder. He looked over to see half of a sandwich hovering there. The peppered meat housed in glittering rye looked absurdly irresistible in the rich afternoon light. The old man shook the sandwich deliberately, then prodded Thomas’ cheek with it. Thomas laughed and took the gift. Without a pause he sank into it, enjoying every meaty molecule that fondled his taste buds. He let each bite hover in his mouth a good while before sending it down. And for a few moments, the only sound was that of the two men chewing, and the occasional wisp of wind. They sat there, one man behind the other, taking in the scenery as the sun shifted to a forty-five degree angle. Thomas rearranged his cap and loosened his belt as he sat back in his chair. He looked back once more at the man and slowly nodded, smiling. The old man smiled gratefully back and raised an imaginary glass to Thomas, who held up his own glass and made a clink noise as he tapped the man’s hand, laughing. “…and imagined the sound of hooves moving along earth.” yap.